1.Anion gap metabolic acidosis. Consider your GOLDMARK differential diagnosis of AG metabolic acidosis (download PDF of GOLDMARK mnemonic). 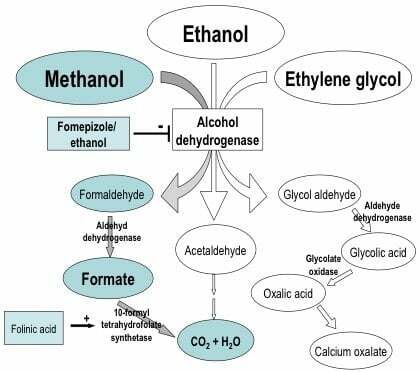 Ethylene glycol may cause renal failure with an elevated creatininecontributing to the AG metabolic acidosis, while both methanol and ethylene glycol may cause an elevated lactate. 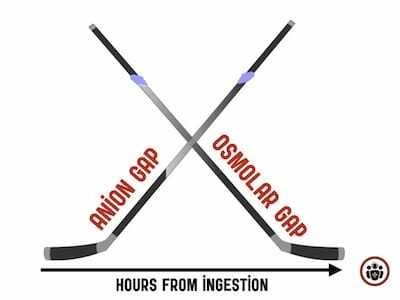 Note that very early after ingestion an anion gap metabolic acidosis has not had time to develop. Absence of an anion gap metabolic absence does not rule out toxic alcohol poisoning.